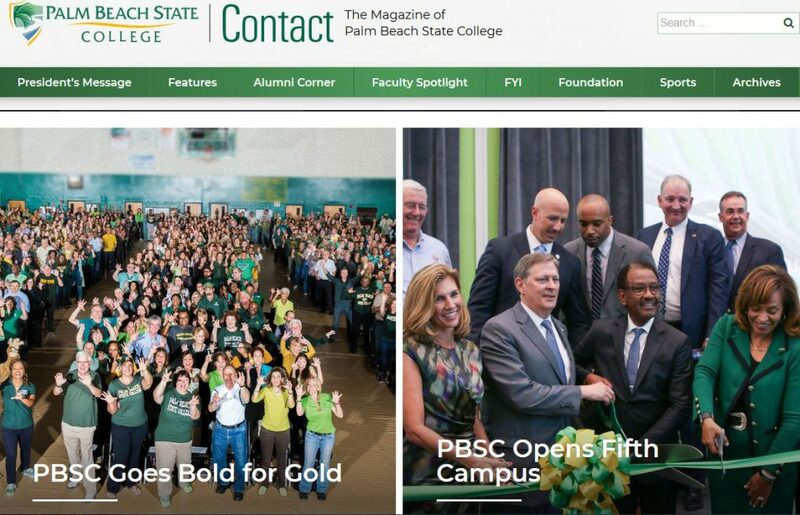 Palm Beach State College has launched a new online version of Contact, its longstanding, award-winning alumni magazine. The site was redesigned by 561 Media, a full-service digital design and marketing agency located in Boca Raton. The new modern design makes it easier to incorporate videos in stories and share content on social media. The Fall 2017 special double edition features articles on the College’s major milestones of the year and more than 60 profiles on outstanding PBSC alumni. Contact is published by the Office of College Relations and Marketing and distributed to more than 60,000 alumni, faculty, staff and donors of the College. The department welcomes submissions of story ideas. To reach the Contact magazine staff, call 561-868- 3122 or email crmarket@palmbeachstate.edu.